Interested in the history of Houston Hip Hop? UH Libraries is happy to be co-sponsoring “Awready! : The Houston Hip Hop Conference” March 27-28. This conference includes a number of events and presentations related to DJ Screw and the evolution of Houston hip hop. The two-day event will kick off with Opening reception and Grafitti, B-Boy and B-Girl Exhibition at Betz Gallery on March 27. The following day will be filled with presentations and panels about DJ Screw and Houston Hip Hop at UH and the 2012 College DJ Battle at Rice University. Special guests include Paul Wall, Chingo Bling, Willie D, and others. The conference is presented by UH Libraries, the HERE Project at Rice, UH African American Studies, and the Cynthia Woods Mitchell Center for the Arts at UH. It also introduces to the public the Houston Hip Hop Archives Network, a partnership developed by the HERE Project and the UH Libraries for preserving the artifacts of Houston hip hop. Registration is free and open to the public, so sign up today! Get a sneak peak and the upcoming DJ Screw and the Rise of Houston Hip Hop exhibit in the new DJ Screw Photographs & Memorabilia digital collection! 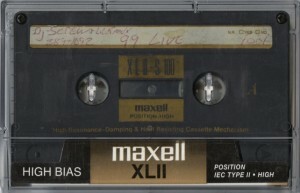 Friends and local rappers began ordering personal tapes from Screw, and he invited the rappers to freestyle, or improvise, over beats at the beginning and end of the tapes. This group became known as the Screwed Up Click, and over time, the rappers themselves developed followings and many released successful independent solo albums. in 1998 DJ Screw opened up Screwed Up Records and Tapes, a shop that sold only his mixtapes. 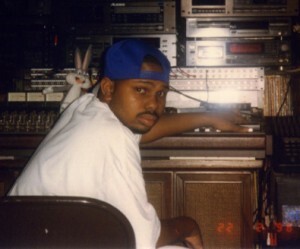 It is estimated that DJ screw sold hundreds of thousands of mixtapes, in addition to releasing four studio albums. On November 16, 2000, DJ Screw was found dead in his recording studio at the age of 29, his death ruled an overdose of codeine and other drugs. Among the items in this collection are photos of DJ Screw and the Screwed Up Click and funeral programs for DJ Screw and other SUC members. The collection also includes a “screw tape” and the notebook of rapper HAWK. 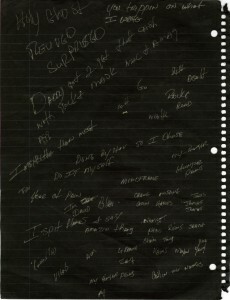 In the notebook, you can see HAWK’s creative process as he works out rhymes for his raps. You can also see how well he played dominoes, since he kept score in the same notebook. These materials are a part of the larger exhibit that will be on view at the M.D. Anderson Library from March 19 through September 21. At the conclusion of the exhibit, selected materials will be added to this digital collection. Also in March, the University of Houston and Rice University will host Awready! : The Houston Hip Hop Conference. To learn more about the conference and related events, and to register, check out the conference web site. Watch this blog for more information about the exhibit, conference, and future digital collection additions. Lin Drees, Capt. Carter Conlin, USN (Ret. 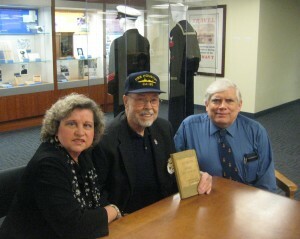 ), and OSC Kendall Palmer, USNR (Ret.) present the Captain's Night Order Book to the UH Libraries. Behind them you can see part of the library's permanent Crusier Houston exhibit. Special Collections recently added a new item to the Cruiser Houston Collection, a USS Houston (CA-30) Captain’s Night Order Book. A night order book is a notebook in which the ship’s commanding officer would write overnight orders concerning course and speed of the ship for the officer of the deck. This book covers the period from April 18, 1939 – October 16, 1940, and is signed by Captains George N. Barker and Jesse B. Oldendorf. It was purchased by a group composed of members of the USS Houston Survivors Association/The Next Generations, researchers of naval history, and members of the Texas Commandery of Naval Order of the United States, and donated to the UH Libraries. Special Collections is excited to announce the publication of a new digital collection, Theodor de Bry’s America. 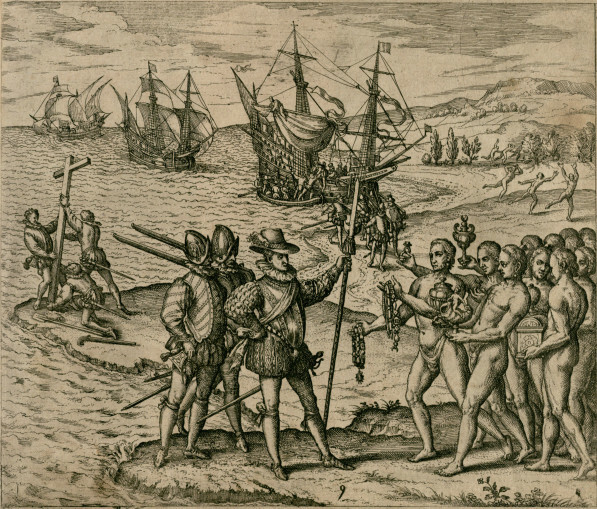 This collection of copper plate engravings depicts the arrival of the Spaniards in the New World. The engravings are taken from the 16th century book Americae, volume IV of Theodor de Bry‘s Grandes Voyages series, a collection of 30 books documenting the new age of exploration. Plate 9: "Columbus, as he first arrives in India, is received by the inhabitants and honored with the bestowing of many gifts"
The illustrations in this collection depict a variety of scenes related to Spanish exploration. Christopher Columbus is featured in many of illustrations, both in Spain and in the New World. 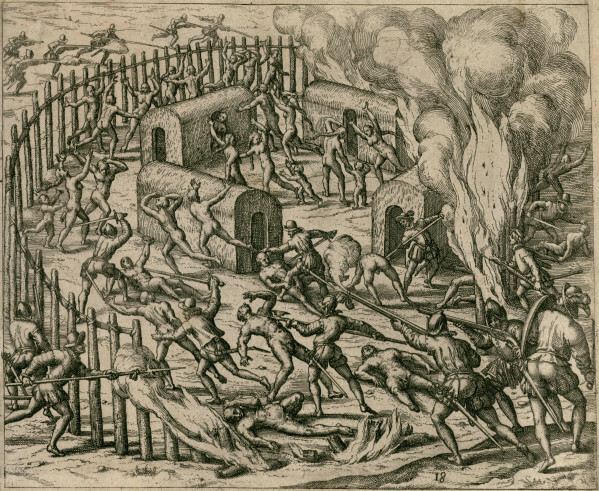 Violence perpetrated on both the Spaniards and the Native Americans is also depicted in detail. Plate 18: "Some Indians are killed, some perish in a fire"
The engravings are in very good condition and can be examined in detail in the UH Digital Library. While only the engravings have been digitized as part of this effort, Special Collections holds a near-complete first edition of the volume. This edition is printed in German, with the exception of the title page, which comes from a first edition printed in Latin. This copy is missing plates 2, 3, 19, 21, and 23, along with an original map. Detail from Plate 24: "The religious ceremony of the Indians"
Take some time to examine these 22 images! 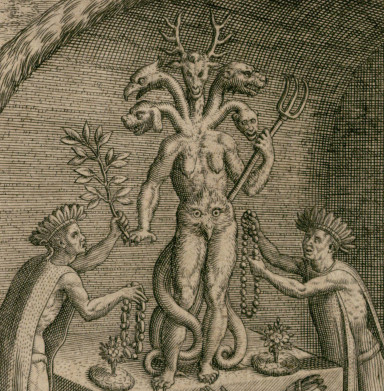 Not only do they represent some of the earliest depictions of the exploration of the New World, but the details in the engravings are fantastic. If you’d like to learn a little more about Theodor de Bry and his Grande Voyages, check out Episode 893 of Dr. John Leinhard’s “Engines of Our Ingenuity” radio program. One of our most visually interesting collections in the UH Digital Library is Scenes from the Middle East. This collection of 114 images from three books provides a view of life in the Middle East during the 19th century through beautiful colored and tinted sketches of the people and places of Afghanistan, Constantinople, and Jerusalem. During this time period, Afghanistan found itself in the middle of the British-Russian conflict known as the “Great Game,” and Constantinople and Jerusalem were part of the declining Ottoman Empire. The works offer a glimpse into the everyday lives of residents, as well as the regions’ natural beauty, ancient ruins, mosques, and other buildings. The three books that are the base of the collection are Sketches in Afghaunistan (1842), by James Atkinson; Lewis’s Illustrations of Constantinople (circa 1837), by John Frederick Lewis; and Sinai and Jerusalem; or, Scenes from Bible Lands (1870), by F.W. Holland. The digital collection also includes the text from Sinai and Jerusalem.